For Europe's establishment, it's out of the frying pan and into the fire. Just when Brussels thought it had avoided a potential firestorm by forcing President Mattarella to veto the prior finmin appointee, preventing prominent euroskeptic Paolo Savona from becoming Italy's next finance minister, and instead in the latest proposed government, the finance minister would be the relatively unknown Giovanni Tria - alongside 5-Star's Di Maio who will be Industry Minister, Salvini as Interior Minister and Conte as Prime Minister - it appears that Tria himself is a rather outspoken eurosketpic. 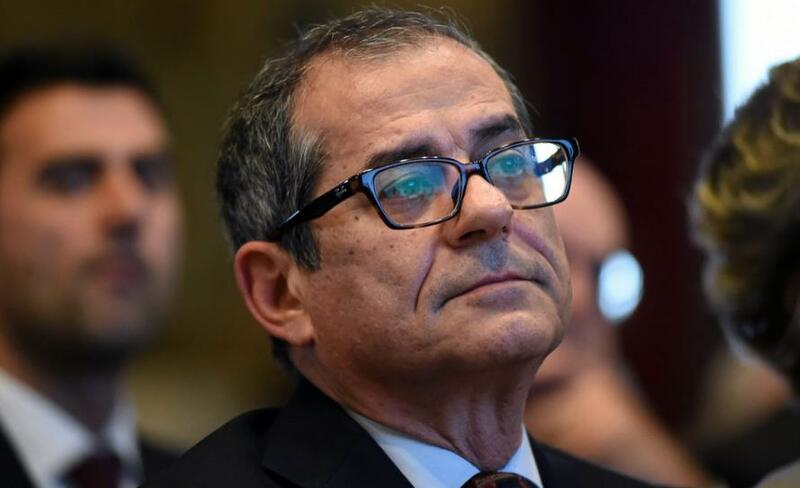 As we reported earlier, Tria, 69, is currently the head of the economy faculty at Rome’s Tor Vergata University. However, investors are far more focused and concerned not with his present, but past and especially his views on the economy, the euro and the Eurozone, to determine if he, too, is a dark horse. And what has spooked the establishmentarians in the early rounds of due diligence is the following article from December 2016 published in the Formiche, titled "Vi spiego la competizione truccata in Europa che favorisce la Germania" or translated "I'll explain the rigged competition in Europe that favors Germany" in which Tria, like other run-off-the-mill euroskeptics, criticizes the European monetary union and its fixed exchange rate for allowing countries - such as Germany - to run high external surpluses and says fiscal policy should compensate for that lack of flexibility. The growing surplus of the German economy shows that monetary expansion, without a policy that aids economic convergence between the various countries, merely fuels an imbalance that puts us in conflict with the rest of the world. The German-driven Europe has not deliberately grasped, wrongly, that excess of virtue (surplus of "ants") produces more damage than excess deficit (of the "cicada" countries). And the measures to cope with the resulting crisis have only worsened the situation, rather than resolving it. To think that the convergence of economies should go through internal deflation to the so-called weak countries (the "cicadas"), and imposed through fiscal consolidation even in periods of recession, has produced generalized deflation and no fiscal consolidation. The objective is to reduce the debt / GDP ratio by working on the two terms of the relationship: to stimulate real GDP growth and at the same time determine the decrease in nominal debt by stabilizing the primary surplus, net of monetary financing. This is a European public investment program, which could be led by the Bei, financed by money for an annual amount of at least 2-3 per cent of the Eurozone GDP, thanks to which the entire eurozone would enter into a decrease in the debt / GDP ratio, stabilizing the expectations of the international financial markets. We hope that the objections to this policy are not reduced to the observation that current rules do not allow it, because it is now established that the current rules. On the other hand, a political cycle that will upset Europe, starting from the elections in Holland on March 15, until the presidential elections in France on April 23rd, the German elections on September 24th and finally the elections in Italy. At this point what is needed, not only in Italy but throughout Europe, is a broad debate, without the demonization of any of the proposals in the field. It is not right who invokes the exit from the euro without ifs and buts as a panacea of ​​all ills, but the president of the European Central Bank, Mario Draghi, is also right when he says that "the euro is irreversible", if it does not clarify the conditions and the times for the necessary reforms for its survival. Also because the greatest danger is implosion, not exit. Changing together, as a positive plus strategic game, is possible and convenient. Going out on your own means paying only for costs without benefits. In short: everyone who rushed to buy Italian bonds and bank stocks on the assumption that all is fixed, may be urgently reassessing this decision now.